Goal setting is a key ingredient of all successful entrepreneurs. Have you ever really thought about the best way to set your goals? Do you think about how your goals have played their part in your success? When I was posed these questions in a recent interview, I gave it some serious thought. I have made my living for the past 18 years doing strategic planning for others. But like the shoemaker whose children are barefoot, often we are not good at doing formal planning for ourselves. As I have shifted gears from consulting to building a technology and data management company, I have had to revert to my craft and actually do some serious planning. I am a funny mixture of long term strategist and the one that knows that a great recipe doesn’t just happen. I love to cook, especially for guests. When making an amazing meal, you have to make sure that you start with a clean surface, the best implements, the finest ingredients, the perfect temperature to cook and the right timing on cooking or baking. When you are done, you don’t just revel in your work by looking at it, you partake of it and savor what you have done. Then you clean up and start all over again. Business is like that. You have to focus on the ingredients – clearing the decks and focusing on what is important, making sure you have the right ideas and the right people to get it done. 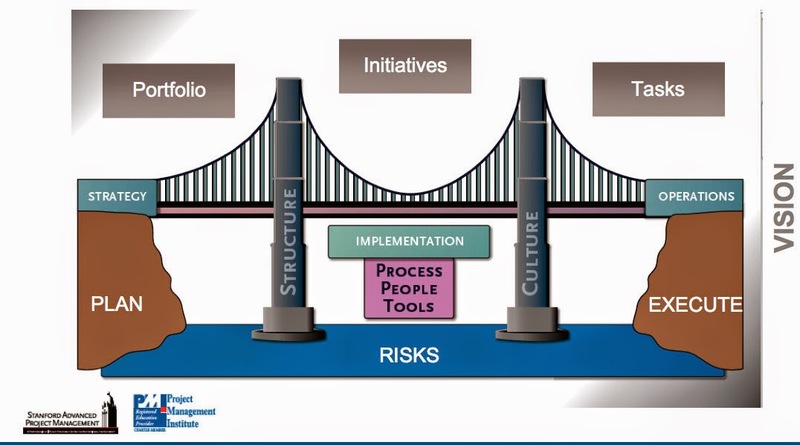 My goals are like a bridge – in fact I use a bridge metaphor in my strategic consulting. If you are doing something new, you have to have a strategy and develop a plan. You must know how it fits within your existing portfolio and what structure is necessary to provide the best environment for success. Then you need to know what initiatives need to be put in place in order to achieve your goals. Within each initiative, there are a list of tasks to be identified and assigned. As you are implementing your strategy, there are also elements that must be considered that impact your processes, your people and your tools. Cultural issues must also be taken into consideration before diving into the task list. A key issue is that those in charge of actually executing the tasks are generally much more comfortable on the right side of the bridge, with an operational mindset. Keeping their eyes on the longer term is not natural, as their focus is close. Put them in a room with the strategists, who are set on the long term vision and you have a dichotomy. But it is possible to meet in the middle! This model works. 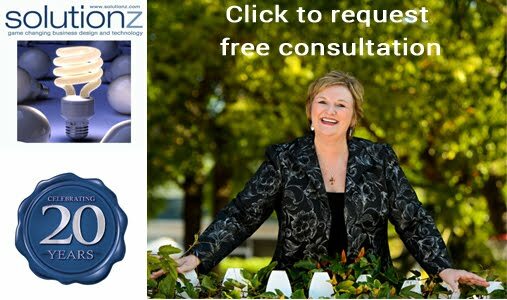 Over the past 18 years of my consulting business, we have used this process hundreds of times to create successful new ventures or expand existing ones. Remember though, no matter how you do your planning, once you have built your dream, you need to celebrate what you’ve built. Most unsuccessful people believe that they suffer from bad luck or Murphy’s Law. Successful entrepreneurs believe that the world is conspiring to help them achieve their goals. 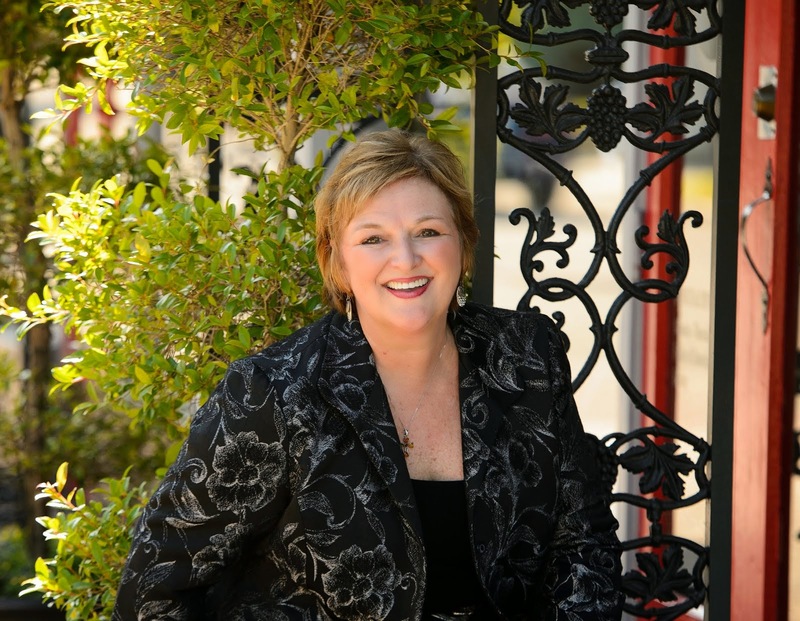 I was recently interviewed on this topic and asked if this principle has played a part in my success in building connections, partnerships and ultimately reaching my goals? My principles go much deeper than an impersonal “law of nature” or the “law of reciprocity”. My life verse comes from Psalm 139 that says that from the foundation of the earth, every day of my life was ordered. I was created to be the very person that I am and to come across the paths of those that can help me achieve my goals, my hopes and my dreams. The nice thing about that perspective is that I just have to wake up every day, and be guided by peace and clarity of vision for the day. That doesn’t mean everything will go smoothly and that there will be no obstacles or no chaos. Like this picture of the path that is flooded, I can take of my magic shoes (see yesterday's blog) and walk on through. I can walk through difficult situations (including a spectacular business failure resulting in significant personal loss) with complete assurance that there is something on the other side of those mountains and that I will be stronger by emerging on the other side. I believe that people are attracted to people who are peaceful about their situation and who have that clarity of vision to know how to persevere, no matter the circumstance. Do you have that peace and clarity of vision about your venture? Jack Canfield has said that "Belief in yourself and your ability to achieve your goals is a well-practised principal of all successful entrepreneurs". And I would go a little farther than Jack's statement and say that this isn't just a trait, it is foundational. I watch alot of HGTV and one of the things I've learned from that show, is that if you walk into a house, it can look great on the surface, but the minute you start looking under floors and behind walls, it becomes very clear, very fast how important the foundation really is. In my own life, my parents sowed self-confidence into us from a very early age, so I haven’t had to build it. Instead I just get to keep building "on it". 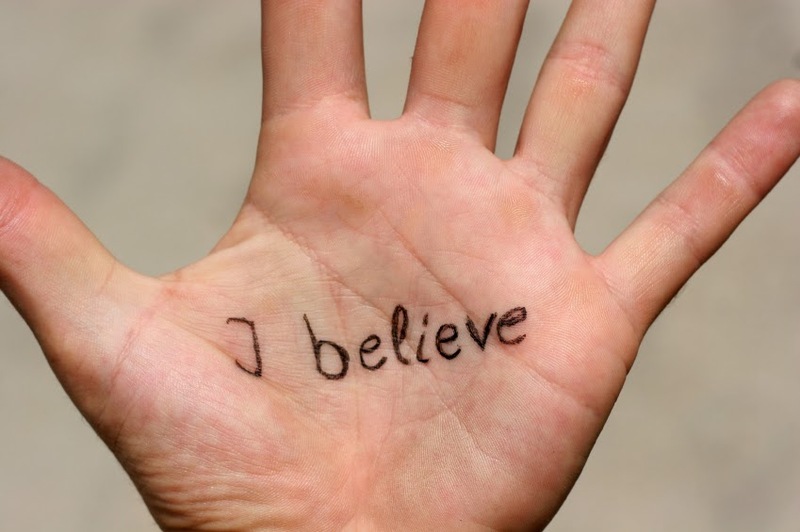 I love the photo of having "I believe" on your hand. For me it has a double meaning. I do believe in myself. But it is because I was born to be a leader and God equipped me with all of the tools that I needed to succeed. For me, it is like being given a magic pair of shoes. All you need to do is step into them and walk. If you leave them in the closet, they do you no good. Figure out what your gifts are and walk in them. Scientists used to believe that human beings responded to the information they received from the outside world. Today, more and more, we understand that people respond to the brain based upon our prior learning and experience. If we have failed mathematics at school we will struggle to manage our finances, right? Fearless entrepreneurs don't consider failure inevitable, no matter what happened in the past. They use the power of belief to overcome “prior learning” and re-program their minds to push aside obstacles, achieve goals and become the person you want to become. I have been very blessed in that I don’t have a lot of “unlearning” to do. My parents raised us to believe that we could do anything or be anything. 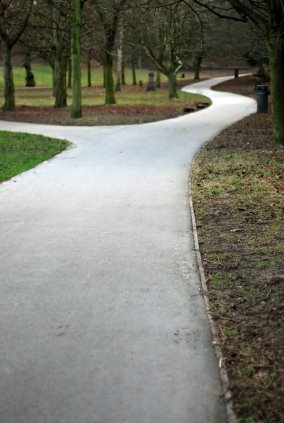 Even though I made a personal choice to quit college after one semester, my drive allowed me to get past the lack of a degree and to live my dream. Their belief was power for me and it has lasted more than 5 decades. The image of the lightbulb is a good one to symbolize that power. This particular portrayal of that power says that you need to think outside of the box. I'll take it one step further. You have to LIVE outside the box. Did you miss the previous segments in this series? Jack Canfield said "One of the reasons most people don’t get what they want out of life is that they fail to decide and define in clear detail what it actually is that they want.". I would say it a different way. You can't fearlessly pursue what you haven't clearly articulated. In clearly defining and stating the things you want, there is a fine balance between reinforcing your goals in everything you do and appearing self-centered and materialistic. This is a battle that I have fought since I was very young, as my parents taught me early on that I could do and be anything that I wanted. Nothing wrong with that, right? Much to my surprise, that same confidence that is the foundation of my fearlessness was often misinterpreted by others as arrogance. I have learned over the years that it is essential as a part of this journey to show your heart to others and not just your determination and drive. Although completely counterintuitive, I believe that vulnerability is actually strength. Hence the transparency of this very blog. Back to knowing where you are going. For me, if what I do only produces incremental change, it is likely that I will get bored with the endeavor. I want to be a part of changing the world and having significant impact (aka, Purpose). I have always been an iconoclast, breaking the mould and being dissatisfied with the status quo. That has been true with my various roles when I was still a part of Corporate America and it was equally true when I consulted. Now that I am building technology for the travel industry, I am solving big problems that have been ignored by my industry and then am giving back of my profits to charity. As I mentioned in yesterday's blog about Purpose, trait #2, I call that changing the world, one trip at a time. I may have to wait longer than most to see the fruits of my labors, but I know that when I do “arrive” that the journey will have been worth it. To be more clear, I want to be the CEO of a well-funded technology company that changes the travel industry. In the short term, I know that I want to fund what I am doing on my own, without obligation to outside investors. That came out of my experience losing $6m of an investor’s money to a spectacular failure in my first technology company.